So it comes down to this: With Rodman securely in the Hall of Fame, and his positive impact conclusively demonstrated by the most skeptical standards of proof I can muster, what more is there to say? Repeatedly, my research on Rodman has led to unexpectedly extreme discoveries: Rodman was not just a great rebounder, but the greatest of all time—bar none. And despite playing mostly for championship contenders, his differential impact on winning was still the greatest measured of any player with data even remotely as reliable as his. The least generous interpretation of the evidence still places Rodman’s value well within the realm of the league’s elite, and in Part 4(a) I explored some compelling reasons why the more generous interpretation may be the most plausible. Yet even that more generous position has its limitations. Though the pool of players I compared with Rodman was broadly representative of the NBA talent pool on the whole, it lacked a few of the all-time greats—in particular, the consensus greatest: Michael Jordan. Due to that conspicuous absence, as well as to the considerable uncertainty of a process that is better suited to proving broad value than providing precise individual ratings, I have repeatedly reminded my readers that, even though Rodman kept topping these lists and metrics, I did NOT mean to suggest that Rodman was actually greater than the greatest of them all. In this final post of this series, I will consider the opposite position: that there is a plausible argument (with evidence to back it up) that Rodman’s astounding win differentials—even taken completely at face value—may still understate his true value by a potentially game-changing margin. First off, this argument was supposed to be an afterthought. Just a week ago—when I thought I could have it out the next morning—it was a few paragraphs of amusing speculation. But, as often seems to be the case with Dennis Rodman-related research, my digging uncovered a bit more than I expected. The main idea has its roots in a conversation I had (over bruschetta) with a friend last summer. This friend is not a huge sports fan, nor even a huge stats geek, but he has an extremely sharp analytical mind, and loves, loves to tear apart arguments—and I mean that literally: He has a Ph.D. in Rhetoric. In law school, he was the guy who annoyed everyone by challenging almost everything the profs ever said—and though I wouldn’t say he was usually right, I would say he was usually onto something. As I explained, “third best” in this case is sort of a term of art, not referring to quality, but to a player’s role on his team. I.e., not the player a team is built around (1st best), or even the supporting player in a “dynamic duo” (like HOF 2nd-besters Scotty Pippen or John Stockton), but the guy who does the dirty work, who mostly gets mentioned in contexts like, “Oh yeah, who else was on that [championship] team? Oh that’s right, Dennis Rodman”). First, without much larger sample sizes, I wouldn’t say that game-by-game win differentials are precise enough to settle disputes between players of similar value. For example, the standard deviation for Rodman’s 22% adjusted win differential is still 5% (putting him less than a full standard deviation above some of the competition). This is fine for concluding that he was extremely valuable, but it certainly isn’t extreme enough to outright prove the seemingly farfetched proposition that he was actually the most valuable player overall. The more unlikely you believe that proposition to be, the less you should find this evidence compelling—this is a completely rational application of Bayes’ Theorem—and I’m sure most of you, ex ante, find the proposition very very unlikely. Thus, to make any kind of argument for Rodman’s superiority that anyone but the biggest Rodman devotees would find compelling, we clearly need more than win differentials. Adjusted Win percentage differential is Rodman’s most dominant value stat, and here, finally, Herr Bjordson edges him. Plus this may not fully represent these players’ true strength: the two qualifying Jordan seasons are from his abrupt return in 1994 and his first year with the Wizards in 2001, and both of Bird’s qualifying seasons are from the last two of his career, when his play may have been hampered by a chronic back injury. Of course, just about any more-conventional player valuation system would rank these players above (or way above) Rodman, and even my own proprietary direct “all-in-one” metric puts these three in their own tier with a reasonable amount of daylight between them and the next pack (which includes Rodman) below. So despite having a stronger starting position in this race than I would have originally imagined, I think it’s fair to say that Rodman is still starting with a considerable disadvantage. So let’s assume that at least a few players offer more direct value than Dennis Rodman. But building a Champion involves more than putting together a bunch of valuable players: to maximize your chances of success, you must efficiently allocate a variety of scare resources, to obtain as much realized value as possible, through a massively complicated set of internal and external constraints. For example, league rules may affect how much money you can spend and how many players you can carry on your roster. Game rules dictate that you only have so many players on the floor at any given time, and thus only have so many minutes to distribute. Strategic realities require that certain roles and responsibilities be filled: normally, this means you must have a balance of talented players who play different positions—but more broadly, if you hope to be successful, your team must have the ability to score, to defend, to rebound, to run set plays, to make smart tactical maneuvers, and to do whatever else that goes into winning. All of these little things that your team has to do can also be thought of as a limited resource: in the course of a game, you have a certain number of things to be done, such as taking shots, going after loose balls, setting up a screens, contesting rebounds, etc. Maybe there are 500 of these things, maybe 1000, who knows, but there are only so many to go around—and just as with any other scarce resource, the better teams will be the ones that squeeze the most value out of each opportunity. Obviously, some players are better at some things than others, and may contribute more in some areas than others—but there will always be trade-offs. No matter how good you are, you will always occupy a slot on the roster and a spot on the floor, every shot you take or every rebound you get means that someone else can’t take that shot or get that rebound, and every dollar your team spends on you is a dollar they can’t spend on someone else. Thus, there are two sides to a player’s contribution: how much surplus value he provides, and how much of his team’s scarce resources he consumes. The key is this: While most of the direct value a player provides is observable, either directly (through box scores, efficiency ratings, etc.) or indirectly (Adjusted +/-, Win Differentials), many of his costs are concealed. Two players may provide seemingly identical value, but at different costs. In very limited contexts this can be extremely clear: thought it took a while to catch on, by now all basketball analysts realize that scoring 25 points per game on 20 shots is better than scoring 30 points a game on 40 shots. But in broader contexts, it can be much trickier. For example, with a large enough sample size, Win Differentials should catch almost anything: everything good that a player does will increase his team’s chances of winning when he’s on the floor, and everything bad that he does will decrease his team’s chances of losing when he’s not. Shooting efficiency, defense, average minutes played, psychological impact, hustle, toughness, intimidation—no matter how abstract the skill, it should still be reflected in the aggregate. No matter how hard the particular skill (or weakness) is to identify or understand, if its consequences would eventually impact a player’s win differentials, (for these purposes) its effects are visible. “Return on Investment” is the prototypical example of invisible value, particularly in a salary-cap environment, where every dollar you spend on one player is a dollar you can’t spend on another. No matter how good a player is, if you give up more to get him than you get from him in return, your team suffers. Similarly, if you can sign a player for much less than he is worth, he may help your team more than other (or even better) players who would cost more money. Note: For a fair comparison, this graph (and the similar one below) includes only the 8 qualifying Shaq seasons from before he began to decline. 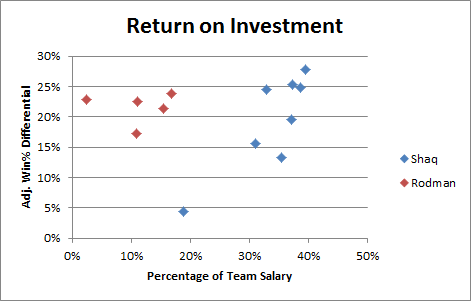 First, return on investment isn’t quite as important in the NBA as it is in some other sports: For example, in the NFL, with 1) so many players on each team, 2) a relatively hard salary cap (when it’s in place, anyway), and 3) no maximum player salaries, ROI is perhaps the single most important consideration for the vast majority of personnel decisions. For this reason, great NFL teams can be built on the backs of many underpaid good-but-not-great players (see my extended discussion of fiscal strategy in major sports here). Second, as a subjective matter, when we judge a player’s quality, we don’t typically consider factors that are external to their actual athletic attributes. For example, a great NFL quarterback could objectively hurt his team if he is paid too much, but we still consider him great. When we ask “who’s the best point guard in the NBA,” we don’t say, “IDK, how much more does Chris Paul get paid than Jason Kidd?” Note this is basically a social preference: It’s conceivable that in some economically-obsessed culture, this sort of thing really would be the primary metric for player evaluation. But personally, and for the purposes of my argument, I prefer our more traditional values on this one. You get 8 people in a room, all posing as GM’s. We’re allowed to select 5 players each from the entire history of the NBA. Then we’ll have a tournament. At PF, I would grab Rodman. And I’m confident that I’d win because he’s on my team. He’d dominate the glass and harass and shutdown a superstar. I think he’s the finest PF to ever play the game. Of course, you need to surround him with some scorers, but when is that ever a problem? The commenter only explicitly goes so far as to say that Rodman would be the most valuable power forward. Yet he says he is “confident” that he would win, with the only caveat being that his team gets other scorers (which is a certainty). So, he thinks Rodman is the best PF by a wide enough margin that his team would be a favorite against the team that got Michael Jordan. Let me play the role of my friend above: whether he means to or not, he’s basically saying that Rodman is more valuable than Jordan. In this example, “position” is the scarce resource. Just as a player can be valuable for the amount of money the team must spend on him, he can also be valuable for his position. But this value can be visible, invisible, or both. This is probably easiest to illustrate in the NFL, where positions and responsibilities are extremely rigid. An example I used in response to the commenter is that an NFL kicker who could get you 2 extra wins per season could be incredibly valuable. These two extra wins obviously have visible value: By definition, this is a player for whom we would expect to observe a 2 game per season win differential. But there’s another, very important way in which this player’s value would be much greater. As I said in response to the commenter, a +2 kicker could even be more valuable than a +4 quarterback. In order to play the 2 win kicker, the only cost is your kicker slot, which could probably only get you a fraction of a win even if you had one of the best in the league on your team (relevant background note: kickers normally don’t contribute much, particularly since bad kickers likely influence their teams to make better tactical decisions, and vice-versa). But to play a 4-win quarterback, the cost is your quarterback slot. While the average QB and the average kicker are both worth approximately 0 games, good quarterbacks are often worth much more, and good kickers are worth very little. Put most simply, because there are no other +2 kickers, that kicker could get 2 wins for virtually ANY team. The +4 QB would only provide 2 wins for teams who would be unable to acquire a +2 quarterback by other means. Or you can think about it conversely: Team A signs the kicker, and Team B signs the QB. For the moment, Team B might appear better, but the most value they will ever be able to get out of their QB/Kicker tandem is +4 games plus epsilon. Team A, on the other hand, can get more value out of their QB/kicker combo than Team B simply by signing any QB worth +2 or greater, who are relatively common. Why does this matter? Well, in professional sports, we care about one thing more than any other: championships. Teams that win championships do so by having the best roster with the most value. Players like our special kicker provide unique avenues to surplus value that even great other players can’t. To generalize a bit, you could say that value vs. a replacement player is generally visible, as it will be represented in win differentials no matter who you play for. But a player’s value relative to the entire distribution of players at his position can lead to substantial invisible benefits, as it can substantially improve his team’s ability to build a championship contender. Unfortunately, in basketball, such distinctions are much more nebulous. Sure, there are “positions,” but the spot where you line up on the floor is very different from the role you play. E.g., your primary scoring responsibilities can come from any position. And even then “roles” are dynamic and loosely defined (if at all)—some roles that are crucial to certain teams don’t even exist on others. 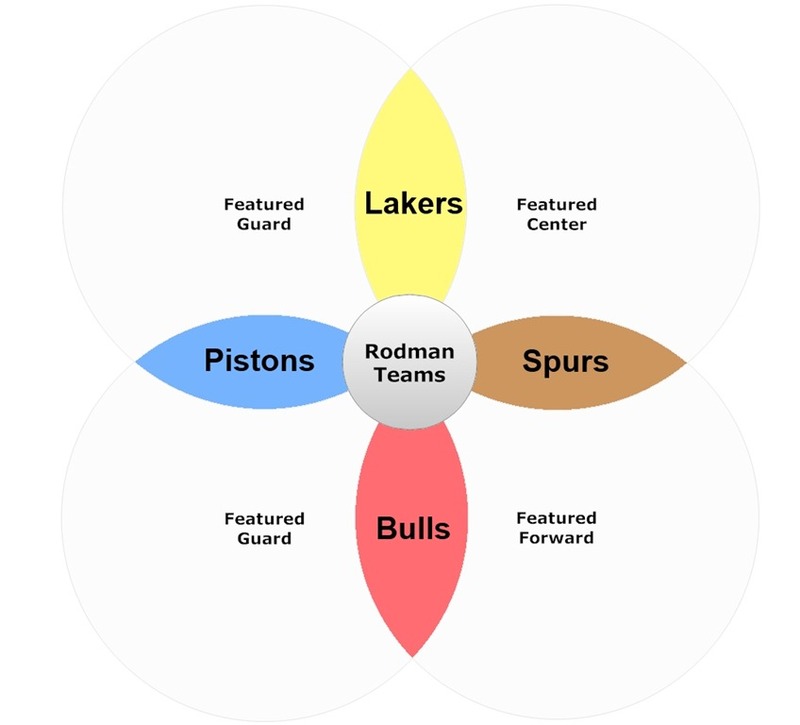 Plus, teams win in different ways: you can do it by having 5 options on offense with 5 guys that can do everything (OK, this doesn’t happen very often, but the Pistons did it in 03-04), or you can be highly specialized and try to exploit the comparative advantages between your players (this seems to be the more popular model of late). Rodman was a specialist. He played on teams that, for the most part, didn’t ask him to do more than what he was best at—and that probably helped him fully leverage his talents. But the truly amazing part is how much of a consistent impact he could have, on such a variety of different teams, and with seemingly so few responsibilities. It improves your team’s chances of building a championship contender. It wouldn’t be reflected in your game-to-game win differential. It stems from some athletic or competitive skill or attribute. Because the value we’re looking for is (by definition) invisible, its existence is ridiculously hard—if not impossible—to prove empirically (which is why this argument is the dessert instead of the main course of this series). However, there could be certain signs and indicators we can look for that would make the proposition more likely: specifically, things that would seem unusual or unlikely if the hypothesis were false, but which could be explainable either as causes or effects of the hypothesis being true. Since the hypothesis posits both an effect (very large I-Factor), and a cause (unusually high value for his role), we should primarily be on the lookout for two things: 1) any interesting or unusual patterns that could be explainable as a consequence of Rodman having a large I-Factor, and 2) any interesting or unusual anomalies that could help indicate that Rodman had an excessive amount of value for his role. Q. What do you get for the team that has everything? Our hypothetical Rodman I-Factor is much like that of our hypothetical super-kicker in the NFL example above. The reason that kicker was even more valuable than the 2 wins per season he could get you is that he could get those 2 wins for anyone. Normally, if you have a bunch of good players and you add more good players, the whole is less than the sum of its parts. In the sports analytics community, this is generally referred to as “diminishing returns.” An extremely simple example goes like this: Having a great quarterback on your team is great. Having a second great quarterback is maybe mildly convenient. Having a third great quarterback is a complete waste of space. But if you’re the only kicker in the league who is worth anywhere near 2 wins, your returns will basically never be diminished. In basketball, roles and responsibilities aren’t nearly as wed to positions as they are in football, but the principle is the same. There is only one ball, and there are only so many responsibilities: If the source of one player’s value overlaps the source of another’s, they will both have less impact. Thus, if Rodman’s hypothetical I-Factor were real, one thing we might expect to find is a similar lack of diminishing returns—in other words, an unusual degree of consistency. And indeed, Rodman’s impact was remarkably consistent. His adjusted win differential held at between 17% and 23% for 4 different teams, all of whom were championship contenders to one extent or another. Obviously the Bulls and Pistons each won multiple championships. The two years that Rodman spent with the pre-Tim-Duncan-era Spurs, they won 55 and 62 games respectively (the latter led the league that season, though the Spurs were eliminated by eventual-champion Houston in the Western Conference Finals). In 1999, Rodman spent roughly half of the strike-shortened season on the Lakers; in that time the Lakers went 17-6, matching San Antonio’s league-leading winning percentage. But, in a move that was somewhat controversial with the Lakers players at the time, Rodman was released before the playoffs began, and the Lakers fell in the 2nd round—to the eventual-champion Spurs. Note: Though obviously it’s only one data point and doesn’t mean anything, I find it amusing that the one time Shaq played for a team that had a full salary-cap’s worth of players without him, his win differential dropped to the floor. So, basically, whether Rodman’s teams were broke or flush, his impact remained fairly constant. This is consistent with unusually low diminishing returns. As we saw above, Rodman’s impact on all 4 teams was roughly the same. This too is consistent with an unusual lack of diminishing returns. As I’ve said earlier, “role” can be very hard to define in the NBA relative to other sports. But to find meaningful evidence that Rodman provided an inordinate amount of value for his role, we don’t necessarily need to solve this intractable problem: we can instead look for “partial” or “imperfect” proxies. If some plausibly related proxy were to provide an unusual enough result, its actual relationship to the posited scenario could be self-reinforced—that is, the most likely explanation for the extremely unlikely result could be that it IS related to our hypothesis AND that our hypothesis is true. The red dot is obviously Dennis Rodman. Bonus points to anyone who said “Holy Crap” in their heads when they saw this graph: Rodman has both the highest win differential and the lowest Usage Rate, once again taking up residence in Outlier Land. Yes, the red dot is Dennis Rodman. Oh, if you didn’t see it, don’t follow the blue line, it won’t help. This chart isn’t doctored, manipulated, or tailored in any way to produce that result, and it includes all qualifying players with positive win differentials. If you’re interested, the Standard Deviation on the non-Rodman players in the pool is .19. Yes, that’s right, Dennis Rodman is nearly 4.5 standard deviations above the NEXT HIGHEST player. 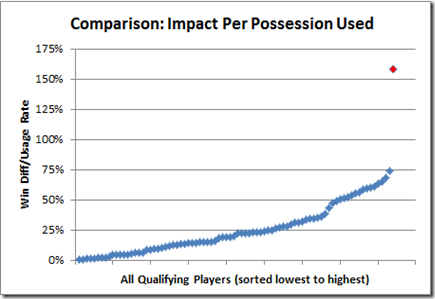 Hopefully, you see the picture of what could be going on here emerging: If value per possession is any kind of proxy (even an imperfect one) for value relative to role, it goes a long way toward explaining how Rodman was able to have such incredible impacts on so many teams with so many different characteristics. The irony here is that the very aspect of Rodman’s game that frequently causes people to discount his value (“oh, he only does one thing”) may be exactly the quality that makes him a strong contender for first pick on the all-time NBA playground. Though the evidence is entirely circumstantial, I find the hypothesis very plausible, which in itself should be shocking. While I may not be ready to conclude that, yes, in fact, Rodman would actually be a more valuable asset to a potential championship contender than Michael freaking Jordan, I don’t think the opposite view is any stronger: That is, when you call that position crazy, conjectural, speculative, or naïve—as some of you inevitably will—I am fairly confident that, in light of the evidence, the default position is really no less so. In fact, even if this hypothesis isn’t exactly true, I don’t think the next-most-likely explanation is that it’s completely false, and these outlandish outcomes were just some freakishly bizarre coincidence—it would be more likely that there is some alternate explanation that may be even more meaningful. Indeed, on some level, some of the freakish statistical results associated with Rodman are so extreme that it actually makes me doubt that the best explanation could actually stem from his athletic abilities. That is, he’s just a guy, how could he be so unusually good in such an unusual way? Maybe it actually IS more likely that the groupthink mentality of NBA coaches and execs accidentally DID leave a giant exploitable loophole in conventional NBA strategy; a loophole that Rodman fortuitously stumbled upon by having such a strong aversion to doing any of the things that he wasn’t the best at. If that is the case, however, the implications of this series could be even more severe than I intended. Despite having spent time in law school, I’m not a lawyer. Indeed, one of the reasons I chose not to be one is because I get icky at the thought of picking sides first, and building arguments later. In this case, I had strong intuitions about Rodman based on a variety of beliefs I had been developing about basketball value, combined with a number of seemingly-related statistical anomalies in Rodman’s record. Though I am naturally happy that my research has backed up those intuitions—even beyond my wildest expectations—I felt prepared for it to go the other way. But, of course, no matter how hard we try, we are all susceptible to bias. Moreover, inevitably, certain non-material choices (style, structure, editorial, etc.) have to be made which emphasize the side of the argument that you are trying to defend. This too makes me slightly queasy, though I recognize it as a necessary evil in the discipline of rhetoric. My point is this: though I am definitely presenting a “case,” and it often appears one-sided, I have tried to conduct my research as neutrally as possible. If there is any area where you think I’ve failed in this regard, please don’t hesitate to let me know. I am willing to correct myself, beef up my research, or present compelling opposing arguments alongside my own; and though I’ve published this series in blog form, I consider this Case to be an ongoing project. If you have any other questions, suggestions, or concerns, please bring them up in the comments (preferably) or email me and I will do my best to address them. Finally, I would like to thank Nate Meyvis, Leo Wolpert, Brandon Wall, James Stuart, Dana Powers, and Aaron Nathan for the invaluable help they provided me by analyzing, criticizing, and/or ridiculing my ideas throughout this process. I’d also like to thank Jeff Bennett for putting me on this path, Scott Carder for helping me stay sane, and of course my wife Emilia for her constant encouragement. First: Thank you for the highly enjoyable reading. 2nd: Jordan is often said to have gone from a great player to “the greatest” player ever when he learned how to make those others around him better. Maybe this is what made Dennis so great. 3rd: So, for all your qualifying in part three, there needed to be injury time to qualify..and hence you needed to make “bjordson”, maybe the question is…how much of a change in winning did a team have with and with out a player, but maybe the question is how much did the other 4 players in the game at the time change with and with out the player. sorry, How did the absence of a player effect the other 4 teammates and opponents and their stats….i think that is a clearer picture. If you’d read the whole shebang, you’d realize that your question has already been answered definitively. This would be fascinating to look at with an infinitely-large dataset. 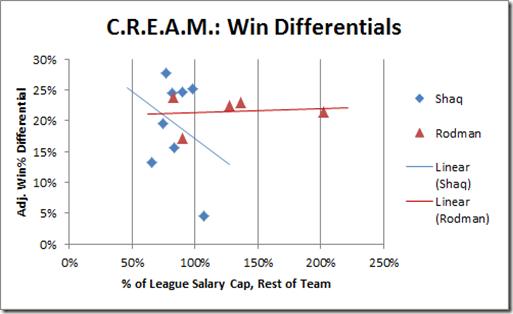 Like, you could examine how the presence or absence of Rodman affected his teammates win differentials. But just looking at how their raw stats change doesn’t really tell you much, b/c strategies and responsibilities shift so much from lineup to lineup. E.g., since Rodman hardly scored, obv with him in the lineup you would expect his teammates scoring to go up. But that doesn’t mean anything unless you know what’s going on with the bottom line. To see the actual affect on individual players impact, you would need an exponentially larger sample, and this one is thin enough as it is. It’s possible something like this could be done with minute-to-minute plus/minus, which is generally less accurate but obv has much more data. Is “Jesus Christ” a perfect substitute for “Holy crap”, because that’s what I said when I saw the last two graphs. This whole piece is truly an outstanding read and a great piece of statistical analysis. Being a native Arizonan, I have always appreciated the fact that some players (Sir Charles) are undervalued for the things that they do or have done on the court. This blog gives my sentiments some factual heft. Well done, sir. It looks like The Worm rediscovered a systematic specialized sweet spot (also known as a position I believe) previously exploited by Bill Russell. I did a very back-of-the-envelope analysis of his and Rodman’s comparable stats a few months back and when adjusted by pace found them to be nearly identical. The possible existence of this particular sweet spot immediately makes one wonder if the stats can be used to find other underexploited (or never exploited) basketball specialization strategies that may have a similar oversized impact. It is theoretically possible that Rodman’s refusal to take a lot of shots on offense unintentionally caused his teams to stumble upon an amazing exploitative strategy that no one had discovered before and that no-one has duplicated since (though, if that were the case, he still might deserve some credit for forcing their hands). But I’ve definitely started to waffle on this. The more 3 and 4 standard deviation anomalies I discover, the more I think maybe it’s the most plausible explanation. It still seems bizarre though, there have been lots of tough-guy defender/rebounder types over the years who didn’t take a lot of shots and none of them has anywhere near the impact of Rodman. I mean, if it were an easily realizable strategy, you’d think somebody at some point would have at least stumbled into something close. Also, in my league-wide study of various statistical profiles and their correspondence to win differentials, I haven’t really found the defender/rebounder types to be the most undervalued (if any particular specialization group is getting a raw deal, it’s prob off-the-bench 3-pt sharpshooters). I hadn’t actually thought of the Bill Russell comparison in that context, but it’s intriguing. 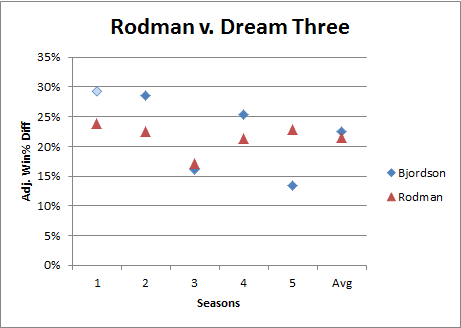 Ignoring pace-affected stats, Rodman had both a much higher TRB% (as prev. discussed) and much tighter shot selection (reflected in higher eFG%: .529 career vs .440), so I’ve generally thought of him as much more willing to specialize than Russell. But then, the league-wide eFG% was like .430 when Russell played and closer to .500 in Rodman’s era, so Russell having an identical “willingness to avoid shots of marginal value” in order to focus on D/R could theoretically lead to those statistical differences while still being perfectly consistent with the strategy Rodman employed. Of course this is gross speculation here, but in that case I would think it might be a combination of team effects and a monster Rodman/Russell type. Perhaps there are multiple necessary conditions, such as the presence of an all-time defender/rebounder specialist and multiple efficient scorers leading to some sort of runaway increasing returns effect. Again gross (but fun) speculation. I’m sure the truth is something different entirely and when revealed will seem obvious in hindsight. As far as off the bench 3 point specialists are concerned, Robert Horry wouldn’t happen to be among that group would he? Thank you. Dennis Rodman is such a rabbit’s hole of mysteries. You’ve gone very, very deep. I have very much enjoyed being able to follow the experience. The aversion to not doing what one isn’t the best at – something I think very rare in the NBA, b/c so many of these guys were at some level (high school, maybe college) the best at many things. It’s pure maximization. A rejection of the “do something over nothing” bias in practice. That’s a very interesting point about the psychology involved. Note also that Rodman didn’t play basketball in earnest until his 20’s, so he may not have cultivated the belief that he was God’s gift to scoring in high school as most others probably did. This is a very good point – the late-coming might also suggest he was looking at basketball more objectively than his peer group in the years he decided to ‘go for it’ because he needed a sharper edge and fast. In that sense, it’s appropriate you refer to him early on as some kind of alien; only a being playing a very different game would stay on the stationary bike for an hour after most every professional contest (as he himself was anecdotally known to). Very good read and a well developed argument. I definitely agree that if you have two primary scoring options, the best player in the history of the game that you could add would be Rodman. What do you think would happen if you were to place Rodman on a team without a Hall of Fame second option? Let’s say this year’s Bulls, I personally think that upgrading from Boozer to Rodman would make less of an impact than upgrading from Deng to Jordan.I (Deng picked even though he’s a SF because his skill level is comparable to Boozer’s and I’m trying to show that just because you have championship caliber surrounding talent, doesn’t mean Rodman’s necessarily the best pick, which is what I took away from the pickup game argument. I really think it takes two All-NBA shot creators for his weaknesses on offense to be hidden. This is a good question that I’ve thought a lot about. But it should be clear, Rodman helped his teams a huge amount whether or not they had two great scoring options, so I don’t think “[hiding] his weaknesses on offense” is really the right paradigm. Rodman’s bonus value comes from that fact that, normally, when you have two star-caliber players, it’s hard to get star-player value out of your third (but with him you can). That said, I probably agree with you that a team with 2 great shot-creators would be ideal. Having read the first few sections, I feel that maybe your admission “the dataset this analysis is based on might not be sufficiently robust to settle the entire “Case” on its own”, might merit further exploration. It does seem like almost everything on this page is based on the WinDiff% as the primary valuation statistic and Rodman’s extreme lead over any replacement in history in that department. Now, you say that “technically, it is possible that Rodman just got extremely lucky in the differential data” but I’m not sure it’s just down to luck. In soccer, differential data is heavily skewed because the best players often do not play games that are easily “winnable”. That is: Rodman had a freak career playing a lot with really successful teams and got a little lucky in which games he did play (combined with the fact that he was very good at an integral part of the game of basketball, especially at the time he played and for those teams). Not a bad thing (certainly HOF-worthy), but also not the same as Best Player Ever. I don’t want to chalk everything up to luck or damned statistics, but the short version of the argument would be: if Ben Wallace had Rodman’s agent and timing (i.e. birthday), we’d be talking about him here instead of Rodman. If I’m overlooking something, please let me know. I may simply be stating the fact that there is no statistic that would please me. 1. Obv he could have been extremely lucky in which games he sat out rather than/in conjunction with being extremely lucky in how his teams performed in those games, but luck is luck is luck–that’s not an explanatory variable unless all four teams he played for intentionally sat him during the games they were least likely to win. 2. As to the era he played being a big factor, I don’t know, it’s possible. If indeed the best explanation for Rodman’s impact is that he was (intentionally or unintentionally) exploiting a loophole in NBA strategy, it’s possible that this loophole has been quietly closed in the interim. But that sort of thing applies to virtually any cross-era comparisons (like batting averages before and after the invention of the curve-ball). b) you’e screwed up royally. Now which do you think is more likely? How long did people think the world was flat? And how long would you have held on to that theory? Personally I put a lot of weight into this article. Especially in the part where the kicker references are made. I think of it like fantasy baseball drafting: you take the limited resources first. Quality shortstops (rebounders) are much more rare than quality first basemen (scorers). The good shortstops are so much better than the average that you have to give them significantly more value. Rodman was just so fantastically much better than anyone around him at his specialties that it made his *teams* demonstrably better. I think you may want to reference back to early in the article where it talks about the over-valuation of scoring and it’s effect upon our subjective views of individual players. You can’t learn anything if your mind is closed. First, I think your work is fantastic – kudos. Second, I think a big part of the challenge here is that player valuation has a big contextual component. For instance, on a team of 5 HOF PG’s or 5 HOF C’s, a mediocre C/PG (respectively) would be “more valuable” than a 6th HOF PG / C. Likewise, I’d argue a Jordan would be much more valuable to a team of 4 Rodman’s than a 5th Rodman, and vice versa. Obviously there are some comparisons that are true pretty much regardless of context (e.g. Jordan > Brian Scalabrine), but I think that many of the comparisons that are interesting to argue about are highly context-dependent e.g. if you postulate that your team has Jordan, Magic, and Jerry West, I bet *any* HOF (and quite possibly even below HOF-level) C/F would be more “valuable” than Kobe. So, with that lengthly preamble, my biggest criticism of your analysis is that you focus on Rodman on champion-level teams, which is certainly interesting, but is usually maybe only 3-5 teams in the league. How valuable is Rodman on the other 25? For instance, I’d think that on this part year’s addition of the Cavs, there’s quite a few players I’d rather have than Rodman – including certainly MJ. Should value be how much a player adds on a championship team? Or a 42-42 team? Or the average of all the teams in the league? Or what? Bottomline (and I am absolutely open to the argument that I’ve missed something), you’ve convinced me that adding Rodman to this year’s Heat might be more valuable than any other player… including Jordan (*shudder*). But, I’d bet 5 MJ’s to beat 5 DR’s 90%+ of games… and I suspect so would you. I was wondering if Rodman owes his unique X-Factor in part because of the players he played with. It seems to me that basketball is a pretty simple game: get more possession, make more of the possessions you get, limit the other team’s possessions, limit the other team’s output on the possessions that they get. Rodman’s main effect is to get your team more possessions and to limit the other team’s possessions by rebounding like a madman. But wouldn’t it stand to reason that Rodman is particularly devastating when paired with a lineup that can also make a lot out of the possession that it gets? When we’re talking about “winning-time” Rodman, we’re talking about a player who is getting possessions at an otherworldly rate for a team that’s devastatingly good at turning those possessions into points. When we’re talking about garbage-time Rodman, we’re talking about a player who is still getting his team possessions at a historic rate, but the other players on the floor might not be able to turn those possessions into points as easily. Even when Rodman played for non-Bulls teams, he would have been paired with his team’s best scoring lineup on offense during those clutch minutes, which seems like a factor that would increase his value and possibly account for his X-Factor. So basically what I’m saying is perhaps Rodman played similarly in clutch and garbage time, but his team was simply in a better position to take advantage of his skills when the game was close and the team had more efficient ways to get the ball in the hoop. Just want to point out that garbage-time is garbage-time for both teams. Therefore for this to be an explanation, you need Rodman’s teams to have a significantly better starters (compared to average starters) than bench (again, compared to average bench). This may be true, but is it a clear result of those teams being great teams? Besides, since there is evidence for something else going on (with off. reb), I don’t see the need for any further speculation. However, I guess if Rodman’s team-mates had high X-factors as well it would support your idea (after all, they all play for the same team). I’m not sure exactly what you’re trying to say. The garbage time idea is that Rodman might have deviated from optimal strategy w/r/t points (by going for rebounds at any cost) in blowout situations where it wouldn’t actually affect his team’s win %. Lineups, opponents, etc are irrelevant. Also, unless they miss games at the same time, there’s no reason why Rodman’s teammates would exhibit the same tendencies. Each of their X-Factors are determined from their perspectives, while Rodman’s impact on MOV and winning remain fixed. Another obvious thought on his rebounding being so good in garbage time is that he got an extreme number of rebounds during garbage time not because he was screwing around and making sacrifices for rebounds, but because more ridiculous shots are being made – in other words, they care less about what they’re doing, and because Rodman is such a good rebounder in general, he’s going to grab those stupid shot rebounds. So it may be that the cause of his ridiculous rebounding in garbage time may have exaggerated his rebounding statistics, but it wasn’t because he was deliberately running up his stats but because people played less “tight” during that time, allowing him more chance to use his particular skill-set. This is a good possibility, but other rebounders don’t show the same tendency. Rodman’s low usage didn’t hurt his title winning teams… when the majority of the top usage guys were above average or well above average of Offensive Rating. It is balancing act. When half of less of the top 4 usage guys were only average or less, they didn’t win titles. When the majority of your 4 top usage players are below average, you’re normally not winning titles regardless. correction: When half “or more” of the top 4 usage guys were only average or less, they didn’t win titles. A low usage guy’s negative impact may be mitigated by enough quantity and quality of higher usage guys. This is practically tautological, as are most criticisms of low usage rate as a negative. What you are saying is that a player who doesn’t use a lot of possessions has a “negative impact” if he doesn’t have good high-usage teammates. But that’s like saying that a great running back has a “negative impact” on his team if it doesn’t have a good quarterback. The whole best “3rd best” player discussion left me wondering what comparisons might be made between the 91-93 Bulls championship teams and the 96-98 ones. The theoretical “1st best” and “2nd best” players remain the same in Jordan and Pippen, while Horace Grant gets replaced by Dennis Rodman. Certainly, the overall W-L records during the Rodman years beat the Grant years. Did Rodman’s presence make the 96-98 teams better? It is July of 2012 now, and the Heat have “a team with everything”. How might you target or draft for such a player? 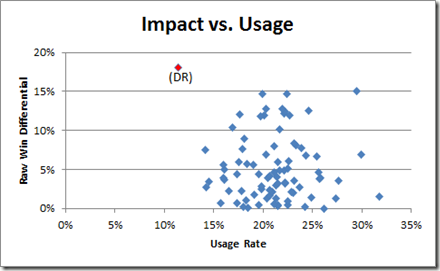 It seems that Impact v. Usage would be the best guide. So who now fits that profile best? That the Heat won still isn’t enough to convince me that they were a great team. That is, if we could run the 2012 playoffs 1000 times, I’m still not convinced that the Heat would win most often. Their convincing performance against the Thunder was well-earned, but they were pretty fortunate in other ways. Chicago and Orlando were both threats that got wiped out by injuries, and the Spurs picked an extremely awkward time to get cold. That said, LeBron is the best in the game right now, and possibly the best ever. It’s abundantly clear that when James and Bosh both play, the Heat are much better. I’d say Wade is the most redundant part, and I’d theoretically be willing to trade him for some size and 3-point shooting. If Ray Ray can still play, that should be a very good get. As to fitting the profile, no one does. There do seem to be some young, slightly-undersized board-attacking guys with limited offensive skills but high adjusted +/-‘s right now. It will be interesting to see how it plays out. Five titles, and 6 of the top 9 rebounding seasons since 1973? It seems like Dennis Rodman is the straw that stirs the drink. In terms of picking the best possible team, there’s actually a pretty major strike against Rodman, and that is precisely what allowed you to notice his great ability to win games for people – namely, the fact that he misses so many games. Indeed, I suspect that really what this tells us is that Rodman is the best player to miss large numbers of games. And it may also be that Rodman appears to be such a ridiculous outlier for another reason – namely, the CAUSE of missed games. When Michael Jordan missed games, what caused Michael Jordan to miss games? Injuries. What caused Rodman to miss games? Suspensions. This means that Rodman, when he wasn’t suspended, was at the peak of his ability, while Jordan would be recovering from an injury. In other words, someone who gets suspended will have a natural advantage over someone who is injured, in that when they’re back on, they’re at full ability still. This may also explain Ron Artest’s extreme placement on one of the charts – he, too, got suspended a lot. This is a rather large biasing factor which works in Rodman’s favor in this analysis, and may also explain some of his x-factor and seeming great ability – when he returned he was whole and healthy. So it is likely that using these missed games to determine how important a player is, while a useful metric, has to be taken with a large grain of salt when comparing players who missed games for different reasons. This may also explain some of his extremity as well – being an extremely good player with very large discipline problems, he appears to be a god because most good players who miss lots of games do so because of injuries, and thus when they come back aren’t quite as awesome for the rest of the season. Being the best player who got suspended constantly thus may make him look even more awesome than he really was, and almost certainly did so. Not to say that he probably wasn’t one of the best players of all time, but it is definitely something to keep in mind. I’ve discussed stuff you raised in first 5 paragraphs elsewhere, and there’s not much to do about it except to increase skepticism of results and require higher burden of proof (which I tried to do). Also, note Artest’s status is bolstered by his Malice at the Palace suspension, which saw a lot of other players suspended at the same time. For paragraph 6, however, I don’t think these concerns really addresses the “x-factor” issue: If he had a suspension vs. injury advantage, it should have manifested in both MOV and W%. OTOH, paragraph 7 I love — at least the concept. Though I’m not sure the causal chain you suggested really does the trick, I think your intuition that we should treat multiple extreme things about a player as likely being related is dead on. And obviously one extreme thing about Rodman was his discipline problems, etc, and I don’t think I really explored that angle fully. I’m so sorry to have found this blog so late in the game. Fantastic! Thanks so much for doing all of that crazy leg-work and writing it up for us stat-geeks who can’t get enough of this kind of stuff. I’ve always believed that Rodman was criminally underrated, and now I have proof! So well written and presented. Some of the Rodman six-sigma rebounding is the well known bias of NBA officials not to call any offensive rebounding calls against ‘star players’ of which Rodman was one. Against this, other ‘star players’ competed with Rodman so he is primus inter pares. – How does Rodman as 3rd best player stack up against Bosh as 3rd best player ? I stumbled onto this analysis through your work at fivethiryeight.com, and I’m glad I did. One thought that I’ve had that nobody else seems to have brought up, but you loosely alluded to in regards to scarce resources, is that Rodman missing games hurts his overall value. If you think of each game as a limited resource (you don’t actually get to play the season 1,000’s of times like in a simulation), Rodman missing substantial portions of seasons should diminish his overall value (he can’t contribute to wins if he doesn’t play, and you said it yourself, the goal is a championship). The goal is championships, but you can’t win championships in the regular season, which (as far as I can recall) was when Rodman had his habit of missing games. The goal in the regular season is to make the playoffs, which in the NBA is easy. A team that can’t make the playoffs with their #3 guy missing some time isn’t gonna win the championship anyway. There’s a myth out there that Dennis Rodman couldn’t score, or wasn’t a good scorer. Judging by his efficiency numbers, this myth actually became fact during the Bulls years. That should hardly be the last word, though, since Rodman turned 35 in his first year with the Bulls, and a lot of guys see their scoring decline at that age. People forget that his second year in the league, Rodman scored 11.6 PPG, which is somewhere closer to typical for a team’s 3rd best player. Rodman was not actually the team’s third option, though. He only got 26 minutes per game, so he was more like a really good 6th man. Oh, and his True Shooting Percentage was .571 and his Total Rebounding percentage was 18.6, and he played suffocating perimeter defense. So I guess he was more like the best 6th man in history. I suspect that this was not the apex of Rodman’s potential as a scorer. He averaged 25.7 PPG in college, and until his Bulls years, he continued to be an extremely efficient, if not prolific, scorer. He just stopped shooting. I suspect that if he been a more typical basketball player and chosen to conduct his career in a more typical way, he could have been a more typical star small forward. Maybe that’s the loophole that Rodman found. Almost every step of his career, he ended up on a team with two other future Hall of Famers, and in almost any configuration, a team with more than two ends up turning one of them into a glorified role player, diminishing his impact and wasting his potential. Rodman just embraced the things that roleplayers do, many of which are things you don’t typically see a guy with HOF athleticism embracing, at least not to the degree that Rodman did. Perhaps that’s why he was just way better at those things.